From Brenda: My niece, Terecille was urging us to go to Maison Harlem with her before we left for our world travels but we were so busy rearranging our lives that we never got the chance. I’m so glad she’s decided to write about it so I can dream of going there next time I’m in Harlem in NYC. Open since the fall of 2012, Maison Harlem was the brainchild of two French expats who have brought a little bit of their homeland to Upper Manhattan right at the onset of what has been dubbed as the Harlem Renaissance 2.0. Many of their repeat customers are a mix of locals and members of the young professional crowd who have called Harlem home in recent years – myself included. This French bistro is, literally, just north of 125th Street, directly across the A/B/C/D train station’s 127th Street southwest entrance – so anyone who complains that it’s too far uptown really have no excuse as the 125th Street stop is an express (15 minutes from Columbus Circle!). It is in a prime location – it’s the only sit-down non-chain restaurant in the vicinity – which makes it the go-to spot for the otherwise residential area alongside Saint Nicholas Park. If it’s ambience you seek, Maison Harlem is the perfect spot for either a friendly get-together, a date, a family meal, or even a party, with its eclectic Frenchified décor. Some nights, there’s live music, and during the warmer months, the coveted two-seater tables on the 127th Street side are available. Travel TIP from Brenda: Right before leaving on our Long-Term travels, we decided to treat ourselves to a few staycations in NYC because we had been staying at Brenda’s parents’ house for 6 months, in NJ. There were nights that we were just too tired to trek our way home. The hotel we enjoyed the most was the Grand Hyatt in Midtown, which is so close to everything and conveniently located next to Grand Central. 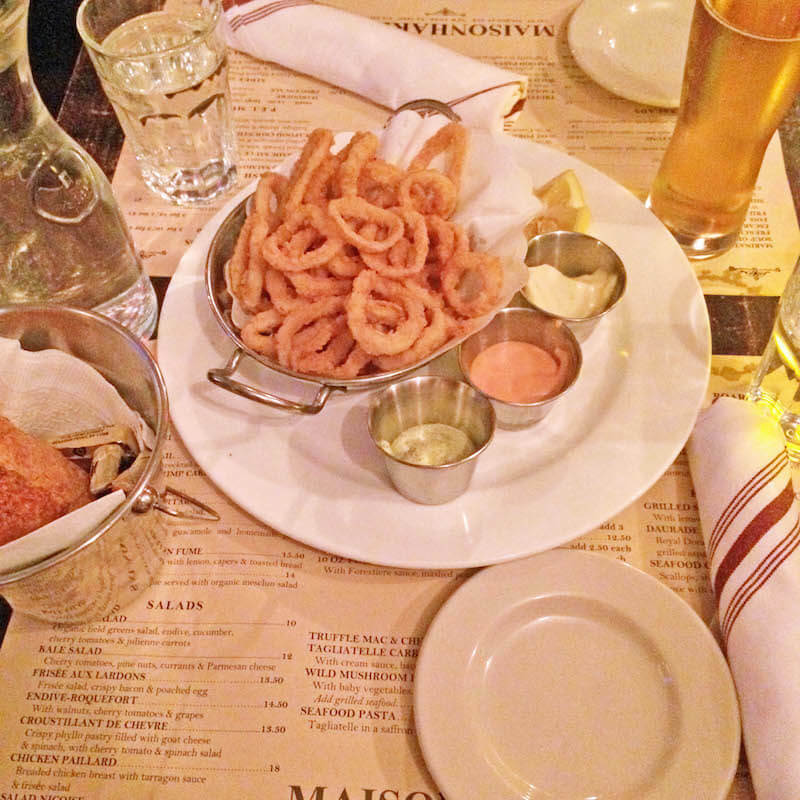 Good location, good timing, and good food, of course, have led to Maison Harlem’s success. Its menu hasn’t changed much during its 2.5-year existence, and that’s perfectly fine – it’s their staples that keep the customers coming. For me and my previous roommate of three years – a fellow Francophile, which explains why my apartment is filled with Paris-themed items, including an Eiffel Tower wall decal, two Eiffel Tower paintings and even an Eiffel Tower lamp – our favorites were two bottles of Cidre and the Fried Calamari to start; P.E.I. Mussels with Marinière sauce (shallots, white wine, parsley) and fries for her; Tagliatelle Carbonara with a light cream sauce, chunks of thick bacon and a raw egg on top for me; and the occasional Chocolate Lava Cake to end our meal. My current roommate and I have carried on the Fried Calamari and (now draft) Cidre tradition, but while I toggle between the Tagliatelle (which I literally crave whenever I think of pasta, which is often) and the Mussels Marinière, my roommate always orders the Seafood Pasta – which is also served with tagliatelle but in a saffron broth with clams, mussels, shrimp and spinach – until our most recent visit, when she got their 10 Oz. Burger. However, I assured her it was a good alternative, as I have ordered countless times from Maison Harlem especially for lunch via Seamless. Since mussels don’t travel/reheat well and sometimes pasta is a bit much for lunch, I once tried the Burger and it was a win. It not only comes with fries, but also a side mixed green salad with a vinaigrette dressing – which can be a meal itself – that also provides toppings for the burger (a generous slice of red onion, a slice of tomato). It also comes with bread – oh, how could I forget about the bread?! Maison Harlem serves halves of warm French baguette in little silver buckets with butter to anyone who is dining, bar or table area, and there is no shame in asking for refills. In fact, my current roommate and I usually go through two refills a visit, so much so that our main man German is always quick to replenish, usually without us even asking. The fact that no dish costs more than $30 (from Brenda: Whoa! Now that I’m in the Philippines, this price point sounds outrageously high, but that is quite reasonable for NYC standards…I guess, how quickly I forgot those prices?!) also explains its loyal clientele, as well as its reasonably priced drinks list – and, might I add, they used to only have Kronenbourg beer on tap, but they have since added Stella Artois Cidre (not to be confused with regular Stella, which I am actually not a fan of), which was previously served bottled. At $6 a glass, it’s a steal – and did I mention their weekday Happy Hour, where beers and house wines are $4, fries are $4 and oysters are $1 a pop? I myself only recently realized this Monday-Friday 5-7pm bar-area special, even though they’ve had them since early 2014! 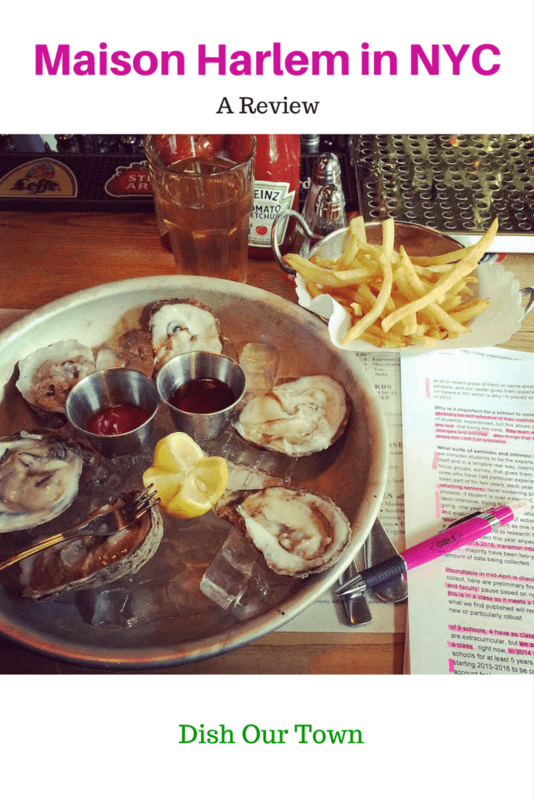 And while I may not like dining alone, I have no qualms about going down the street to Maison Harlem for a half-dozen oysters, an order of fries and a Cidre on my own after a long day of work – which often means I’m doing work as I feast on my oysters and fries (as seen in one of the photos above). Pretending to be sitting at my favorite cafè in Paris. But that’s quite all right, thanks to the vintage chic ambiance of Maison Harlem: work or no work, alone or with friends, I’m always pretending to be sitting at my favorite cafè in Paris anyway (albeit without the view of the Seine or the Notre Dame), or as if I’m at the very same cafe that Owen Wilson’s character goes to whenever he’s transported to the 1920s in Woody Allen’s “Midnight in Paris”. In case you want to visit Paris sometime soon… here’s Brenda’s short travel guide to Paris. 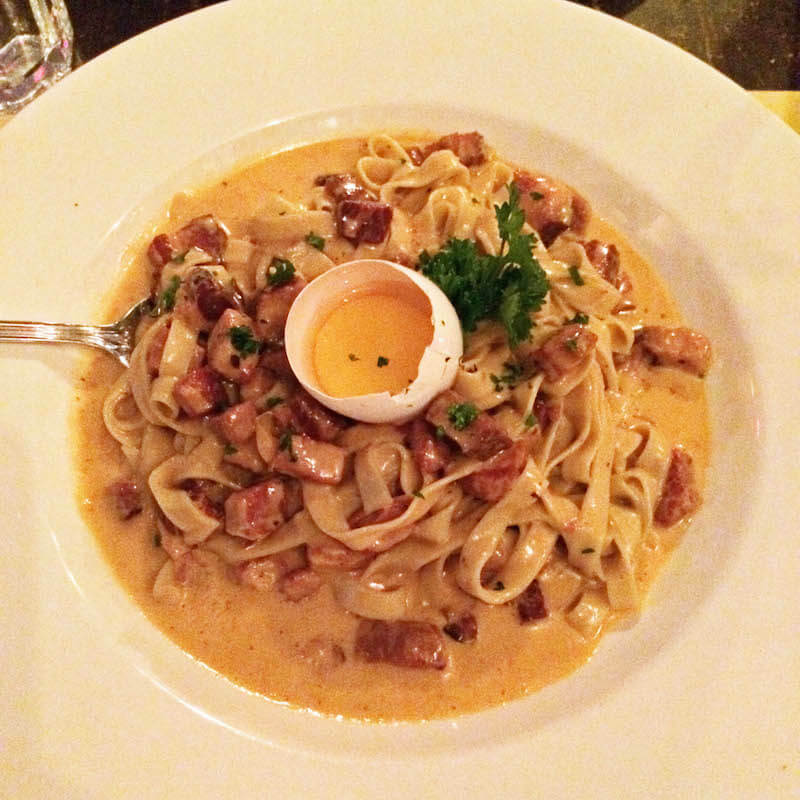 Make sure you share this dish with your friends and help them dream about Paris in NYC! From the calming music to the moment they spent with me.